While pasta is cooking, melt butter in 3-quart saucepan over low heat. Stir in flour, salt, 1/2 teaspoon Italian seasoning, the pepper and garlic. Cook over medium-low heat, stirring constantly, until mixture is smooth and bubbly; remove from heat. Stir in milk. Heat to boiling over medium-high heat, stirring constantly. Boil and stir 1 minute; remove from heat. Stir in cheese blend and 1/4 cup of the Parmesan cheese until melted. 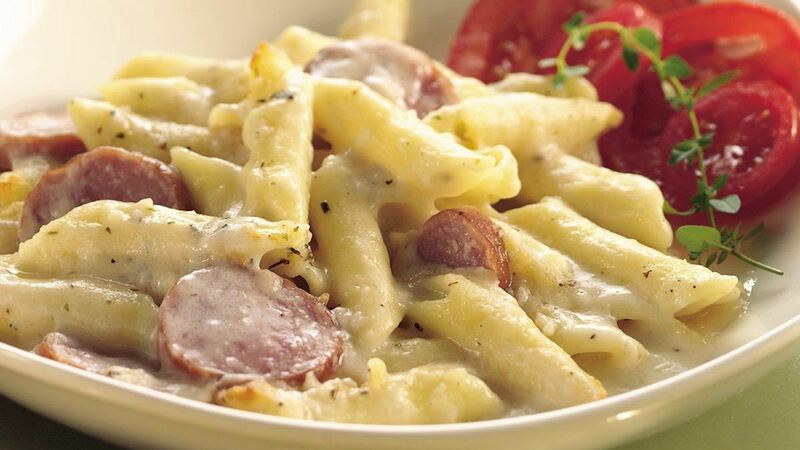 Gently stir pasta and sausage into cheese sauce. Pour into ungreased 3-quart casserole. Sprinkle with remaining 1/4 cup Parmesan cheese and 1/4 teaspoon Italian seasoning. Bake uncovered about 30 minutes or until bubbly. Substitution: Pasta shapes besides penne work in this casserole. Elbow macaroni, medium shells, radiatore, rotini and cavatappi are all fine choices. Substitution: We've used cooked, smoked sausage in this upscale macaroni and cheese to give it a subtle smoky flavour. Reduced-fat smoked sausage, turkey sausage or kielbasa sausage work, too. Substitution: Sub this topping for the Parmesan and Italian seasoning combo: 1/4 cup Italian-style bread crumbs and 1 tablespoon melted butter or margarine.